Crafters Sculpting Tool Kit - Dino Rentos Studios, INC.
AC plug-in-the-wall power supply, Sculpting Tool, Instructional DVD with bonus featurette: Magic Mountains (featurette is a $9.95 value). Our most popular and versatile tool. One speed plug-in-the-wall power supply and Hot Wire Sculpting Tool. Comes with 12 feet of tool cord, and six hot-wires! 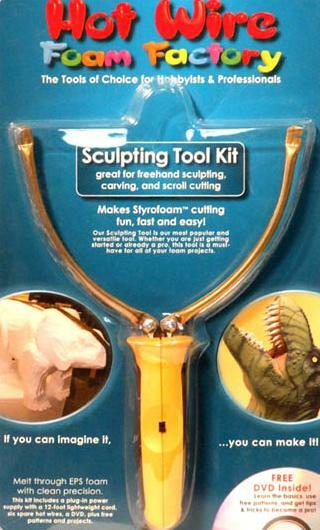 This tool is very popular for carving mountains and shaping designs. Now comes with a handy slide switch right on the handle.